Well Yesterday I did it. I completed one of my running goals...to complete the Triple Crown. I also completed my longest race ever. On top of all of that, I did it injured. I will take a couple of days to be proud of myself for accomplishing what I set out to do, and then the clock resets for my next goal, The Kentucky Derby Marathon. 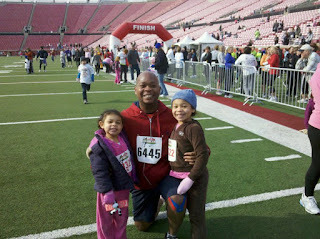 So yesterday was the Rodes 10K Race, the Second Leg of the Louisville Triple Crown. This was my longest race I have been in. While I have done 3 times the mileage in Marathon Training, anyone runner will tell you that Race Day Running is on a different level than training running. So the starting for this race was chaotic at best. It was so insane, my wife and daughters couldn't stay and watch me start because it was getting unsafe for my daughters to be standing around because the crowd was getting out of hand. So once I crossed the starting line (about 10 minutes after the race start), I hit Start on my Garmin and started. As I came up on the 1 mile marker, I felt good...I decided to check out my Garmin to see my pace. I almost flipped when I saw 9:28. Not because I was doing an incredible first mile, but while I am a beginner runner, I know enough about proper pacing. I also know, this being my first 10K, I didn't want to gas out. This is a healthy alternative to the fried version, and has much more flavor without killing sodium levels. This literally came to me as I was driving home (most of my creative food ideas do...I'm like Iron Chef lol) Feel free to adjust how you would season either the fries or the fish. All I know is, there are NO leftovers, and my daughters had two servings of fish! -Spray cooking spray on the baking sheet. Slice your sweet potatoes. Then put the sweet potato slices on the sheet. Drizzle olive oil (not a lot). then season how you want (I used Garlic Salt, and some of my own dry rub seasoning). Sit the baking sheet to the side.